The Delhi Cabinet today decided to grant a subsidy of Re 1 per unit up to the consumption of 200 units per month. The decision will be implemented with effect from July 1, the day when the new tariff announced by the DERC came into force. As the result of sultry weather with six degrees above normal for this time of the season (maximum 41.8° C and minimum 32.3° C) and humidity of 67 per cent, the peak power demand today reached 5,454 MW. The Delhi Cabinet today decided to introduce new cluster buses, taking the number of such buses plying under DTC routes to 3,000. Municipal schools will now develop more friendly environment with setting up of libraries, introduction of systems to aid learning and ensure water and sanitation facilities, besides encouraging child groups. With the order of the Lt. 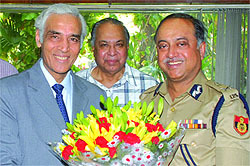 Governor, Tejendra Khanna today, there is a minor reshuffle in the Delhi police among its senior officials. SBK Singh, a 1988-batch IPS officer, in charge of Prime Minister's security, has been posted as Joint Commissioner of Police in the crime branch. A 54-year-old property dealer was arrested yesterday for allegedly cheating people of Rs 2 crore by using forged papers to sell land to them, which had already been sold by him. Three persons have been arrested for being allegedly involved in an incident of beating and robbing a 50- year-old woman of Rs 35 lakh at knifepoint in her house at Ashok Vihar. The police is searching for two more accused, including the victim's servant, Rahul, alias Vijay and Raghav. A body of a 20-year-old youth with multiple injury marks was found inside his friend's apartment at Kondli in East Delhi this afternoon. A 22-year-old youth is suspected to have mysteriously disappeared after he arrived at Indira Gandhi International Airport (IGIA) here last night, to reportedly attend an interview for Kingfisher Airlines. This will benefit around 20 lakh domestic consumers out of the total 34 lakh consumers, that is around 59 per cent of the total domestic consumers. While speaking to the mediapersons after the Cabinet meeting, Chief Minister Sheila Dikshit said that Delhi is the only state in the country which has offered the maximum subsidy of Rs 40 on LPG cylinders from 2007 onwards. It has also been providing subsidy on limited consumption of power across all the sections of society to encourage the judicious use of power. Consequent upon the announcement by the Delhi Electricity Regulatory Commission (DERC) to hike power tariff from July 1, the state government had been discussing the issue of providing relief to the domestic consumers. The government will release an amount of Rs 222.40 crore for the subsidy. Dikshit stated that 200 units are enough to use at least two fans for 20 hours per day, two tubelights for 6 hours per day, one TV for four hours per day, a refrigerator round the clock and a water pump for an hour or so. Around 5.42 lakh consumers under BYPL, 8.32 lakh consumers under BRPL and 6.13 lakh consumers under TPDDL will benefit from this subsidy. The Chief Minister stated that the subsidy will give a big relief to all the consumers and also encourage them to conserve energy so as to come within the subsidy slab of 0-200 units per month. She said Delhi is only the metro city in the country where power tariff is much lower than that of other cities. In Delhi, the revised power tariff is 0-200 units, Rs 3.70; 0-400 units, Rs 4.80 and above 400 units, the power tariff per unit is Rs 6.40. After the subsidy, the tariff will be Rs 2.70 per unit up to the consumption of 200 units per month. The power demand in the area of BSES Rajdhani Power Limited was 2,240 MW and it was 1,402 in the region of BSES Yamuna Power Limited. It broke all previous records touching all-time high and triggering power outages for long hours in many areas due to mismatch in demand and supply. The previous highest power demand in the city was recorded on June 26 when it soared to 5,389 MW. Though, the weather department has predicted partly cloudy sky with possibility of thundershowers for tomorrow, the maximum and minimum temperatures are expected to hover around same degrees. Chief Minister Sheila Dikshit said that the agreements in respect of five out of the 17 identified clusters have already been signed. The buses under the cluster number four and five are operating partially. The Cabinet has now given a green light to the buses under clusters 6, 7, 8 and 9. At present, 247 cluster buses are plying on the road. The number of cluster buses will go up to 3,000 after the introduction of new buses. Besides, the DTC has been plying 5,775 buses. The transport department has taken steps to increase the parking space for more cluster buses, the Chief Minister said. The total requirement of public transport buses in Delhi has been mandated by the Supreme Court after considerable hearing, and therefore, the total requirement of 11,000 buses for Delhi should not be reduced. The buses will be in ratio of 60 in respect of cluster buses and 40 in respect of DTC buses, the Chief Minister said. Society for All Round Development (SARD), a non-government organisation, has identified municipal schools in the city under "lead school concept" in which efforts will be made to make schools more safe and interesting for students. The SARD advocated the involvement of civil society in educational work. "Efforts are being made to change the attitude and behaviour of the MCD teachers so that children feel empowered, protected, respected and live with dignity after attending schools. But absence of political will and bureaucratic delay has created hurdles in the work," said SARD chief executive Sudhir Bhatnagar. He said that teachers need orientation from time to time to keep pace with the current educational needs. Speaking at a function organised by the SARD, in coordination with Plan India, leader of the House in North Delhi Municipal Corporation Dr Mahendra Nagpal said that he would move a resolution in the House demanding involvement of civil societies in expediting work in the field of education. Plan India also intends to make "bal sadan" in every school in order to give platform to children to voice their problems. MCD's former Mayor Mahesh Sharma said that the percentage of dropouts from schools had gone down because of incentive based enrollment in schools and involvement of the civil society such as the SARD and Plan India. Global campaign like learn without fear's main objective is to end corporal punishment, bullying, emotional abuse, sexual abuse, gender discrimination and teasing. "Civil society organisations have succeeded in ending violence to some extent but a lot more needs to be done. The MCD teachers are being trained on various techniques of positive discipline in coordination with NCERT," said Preeti from Plan India. With the order of the Lt. Governor, Tejendra Khanna today, there is a minor reshuffle in the Delhi police among its senior officials. SBK Singh, a 1988-batch IPS officer, in charge of Prime Minister's security, has been posted as Joint Commissioner of Police in the crime branch. A 1995-batch IPS officer, Zorammawia has been posted as Additional Commissioner in security wing, while V Lalthakima from the 1998 IPS batch has been posted as Additional Commissioner in armed police and Sanjay Kumar, a 1998-batch officer, has been posted as Deputy Commissioner of Prime Minister's security. P Karunakaran, a 2004-batch officer, has been promoted as Deputy Commissioner of Police and will be in charge of north-west district. He was presently Additional Deputy Commissioner in outer district. LT Hrangchal of 2003 batch, who is in charge of 4th Battalion as Deputy Commissioner has been transferred to police control room (PCR) in the same rank. John Neihlaia, who is DCP in PCR, has been posted as DCP in departmental enquiry cell. Apur Bitin, a 2002 batch officer, has been posted as DCP in riot cell, while Kime Kaming of 2004 batch has been posted as DCP in the 4th Battalion. Mohd Akhtar Rizvi, a 1997 DANIPS officer, has been posted as Additional DCP-I in outer district. He was Additional DCP in economic offences wing. Mohammad Ali, another 1997-batch DANIPS officer, has been posted as Additional DCP-II in north-west district from south district. According to Additional Commissioner of Police (west) V Renganathan, Rajpal Singh was arrested near Bhud Baral village in Meerut, Uttar Pradesh. He said that Rajpal had fled with the money which he had to give to the landlords whose land he had sold. He had an office under the name of "Choudhary Property", located at Jai Vihar in Baprola, Delhi. In 2006, Randhir Singh and his brother, both are the landlords of Baprola village, had given him their land for selling it. In 2010, Rajpal sold the land but did not pay the amount to the landlords. "He instead used it to build his houses. He started cheating people by using forged papers to sell them the land which had been already sold by him. He collected crores of rupees and fled with the family after disposing his property and office located at Jai Vihar," said Renganathan. Thereafter, two cases of cheating people of Rs 79 lakh and Rs 42 lakh, respectively, were registered against him at the Ranhola police station. The west district police raided the residents of his friends and relatives at Delhi, Meerut, Muzaffarnagar and Ghaziabad. But, he could not be traced. "The police tracked Rajpal's old mobile phone number, which he was not using. We started telephoning his contacts to learn where he could possibly be hiding. We then zeroed in on Bhud Baral, Partapur and Achhonda that are located in Meerut," he said. Last evening, he was arrested near Bhud Baral. Thereafter, six more complaints were lodged at the Ranhola police station by people who were allegedly cheated by him of Rs 57 lakh. Three persons have been arrested for being allegedly involved in an incident of beating and robbing a 50- year-old woman of Rs 35 lakh at knifepoint in her house at Ashok Vihar. The police is searching for two more accused, including the victim's servant, Rahul, alias Vijay and Raghav. Rahul was employed in the victim's house three days before he and his accomplices robbed her. The arrested individuals are Ram Kumar and Arjun, both belong to district Gonda in Uttar Pradesh, and Rakesh who is a resident of West Patel Nagar. According to Additional Deputy Commissioner of Police (North-West District), Romil Baaniya, on June 25, the victim, Manju Jain (50), a resident of I-64 of Ashok Vihar, reported that at 3.20 pm, two men entered her house and beat her with the assistance of her servant, Rahul. Manju was alone at home as her husband, who is an industrialist, had gone to his office. "They had fled after robbing cash and jewellery worth Rs 35 lakh at knifepoint," said Baaniya. The investigations revealed that the victim had not done a police verification of Rahul. She disclosed to the police that he had been hired from one, Mukesh, who is a placement agency owner. Mukesh told the police that Arjun had referred Rahul to him. Arjun is also from Gonda. According to Baaniya, a CCTV recording of house number I-55, near the victim's residence, was shown to her and Arjun, who identified Ram Kumar and Raghav in the video. The police obtained the addresses of Ram Kumar and Rakesh from Arjun and apprehended them from their houses. The police claimed to have recovered jewellery worth Rs 15 lakh and cash of Rs 4.77 lakh from the arrested persons. Later, Arjun who had provided the servant, Rahul was also arrested. "Rakesh and Arjun are the main conspirators in this case," said Baaniya. Ram Kumar disclosed to the police that his accomplices, Rahul and Raghav, are his distant relatives and residents of Gonda. They met Arjun for job. "Arjun told them that he could arrange work for them, but they would have to rob cash and jewellery from a house. Thereafter, Arjun arranged work for Rahul at Manju's house. On June 25, according to the plan, Ram Kumar and Raghav came there and with the help of Rahul entered the house and overpowered the complainant and robbed cash and jewellery," said Baaniya. The officer added that after committing the offence, they reached Daya Basti railway station and telephonically informed Rakesh about the incident. As Arjun was not there, they reached Ghaziabad railway station and boarded the train for their native place in Gonda. The police is searching for Rahul and Raghav. The deceased is identified as Harsh Wardhan, who stayed in an apartment near his friend's flat. The police is investigating the matter. According to the police, the incident was reported from Janta flats at Kondli at 11:30 am today. A police team reached there and found a youth lying dead in the apartment. The youth had marks around his neck and body. The police believes that Harsh was smothered to death. However, it is waiting for the postmortem report to ascertain the exact cause of death. The police said that the house where Harsh's body was found belongs to his friend, Shekhar. Investigators said that on Sunday night, Shekhar and his father were present inside the house. Shekhar is reportedly missing after the incident and the police claims that his father is not cooperating in the investigations. Presently, the police is suspecting Shekhar's involvement in the murder. Shekhar and Harsh were into the property business. A case under Indian Penal Code (IPC) section 302 (punishment for murder) has been registered. Gaurav Sharma (22) came with his father to IGIA at 8.30 pm. According to the police, a person had promised him a job with Kingfisher Airlines and so he arrived from Kanpur yesterday. Gaurav, however, learnt that there was no interview for him with the airlines. A couple of minutes after Gaurav reached the airport, he told his father that he would be back after a while. He then disappeared and could not be found anywhere. The police examined the CCTV footage of the airport. In the video, it saw Gaurav walking into the airport metro station, popularly called the Delhi Airport Metro Express. He has remained untraceable since then. The matter will presently be investigated by the metro police.